If you live in Britain then you’ve likely heard of the 5:2 diet, aka ‘The Fast Diet’, popularised by Dr. Michael Mosley in the BBC Horizon episode, Eat, Fast and Live Longer. Since the programme first aired in August 2012, thousands of people have latched on to his method of Intermittent Fasting for weight loss. Celebrities like Hugh Fearnley-Whittingstall have climbed on board and now there’s a book on the subject, the fast diet, co-authored by Mosley and food and fashion writer Mimi Spencer. Intermittent fasting is nothing new, and it’s a subject I’ve been interested in for the last few years, ever since I started reading about ‘primal’ and ‘paleo’ diets and how eating as our ancestors ate may have benefits to our overall health (I’ve found Mark Sisson’s work on Mark’s Daily Apple particularly interesting, useful and inspiring). But what’s amazing about Mosley and the Horizon programme is how strongly it’s struck a cord with what seems like the entire nation. I know dozens of people who have been doing the 5:2 diet, and what’s incredible is that they’ve been keeping it up and seeing results for weeks and months. So what is the 5:2 diet? In case you’ve somehow missed it, the 5:2 diet works like this: two days a week you restrict your calories to 500 per day if you’re female, or 600 per day if you’re male. It doesn’t matter which days you choose to fast or how you partition the calories throughout the day. On non-fast days (“feast days”), you can eat whatever you want. Perhaps this is what’s sold the nation on 5:2: the method is so simple and easy to follow. You can have your cake (and your beer, chips and chocolate) and eat it, too. It’s not socially restrictive. The only real hard part is not eating much two days a week, which isn’t really as hard as it sounds. The book has merits, though. The most useful bits are the first few chapters that describe the science behind intermittent fasting and why this crazy 5:2 thing might actually be the way forward, not just for weight loss, but for disease prevention and long life. When we fast, we fool our bodies into thinking we’re in a potential ‘famine’ situation, and our body responds by toughening up. A major player here is growth hormone IGF-1, a hormone that influences cell reproduction, and thus ageing. Fasting causes levels of this hormone to drop, and in response, repair genes to switch on. This is a good thing, and has huge implications for reducing age-related diseases. Fasting also gives our pancreas a rest, which improves insulin sensitivity and thus reduces our risk of diabetes, obesity and heart disease. There is also evidence that fasting improves your mood. Oh yeah, and you tend to gradually lose weight, too (a natural effect of dramatically restricting your calories twice a week). At least, this is all true in theory. The problem with the science behind intermittent fasting is that most of it has been done on mice. In reading the book, you get a sense of the hand-waviness behind some of the theories. Dr. Mosley and Ms. Spencer aren’t shy about this, and that is why only a small portion of the book is devoted to ‘science’, and the rest devoted to their own personal experiences with fasting and tips for making it work for you (groan, it becomes a ‘diet’ book). I’ve practising intermittent fasting since December, but I’m loathe to call it “5:2” because my approach and my motivations are a bit different from most people I know (and I’ve never really liked being part of the “in crowd”). I’m less interested in losing weight than I am in longevity and mental health. I’ve already been through my own “weight loss journey”, and I’m grateful to have succeeded, but it’s left me with certain mental baggage about ‘diets’ and ‘calories’ that I’d rather cast aside. I like that intermittent fasting frees the mind from thinking about food as calories (except on fast days, of course). Also, in the same way that “feast days” allow food to be truly celebrated (as it should be – there should be no such thing as a “guilty pleasure”), fast days too offer a different kind of freedom. If you’re a foodie like me, then you tend to obsess about food – what’s for dinner? What can I make today with all the ingredients I have? (How lucky are we to live in the modern world?!) And so I find fast days quite liberating: for a good solid chunk of the day, I just don’t have to think about food and I can get on with other things, be it work, writing, cleaning or walking (admittedly, the more active I am on fast days, the easier it is to forget I might be hungry). I’ve seen many foodies channel their food obsessions towards creating really amazing super low-calorie fast day recipes. But here’s my issue with this: on fast days, I don’t want to worry about food. In fact, I personally find the idea of eating a lot of small pathetic meals throughout the day extraordinarily depressing. So my “fasting” approach is to simply eat nothing all day until about 6pm, at which point I have a “sensible meal”. I don’t typically count the calories, but I don’t go crazy either. I deliberately try to have a light meal, and usually go for soups. 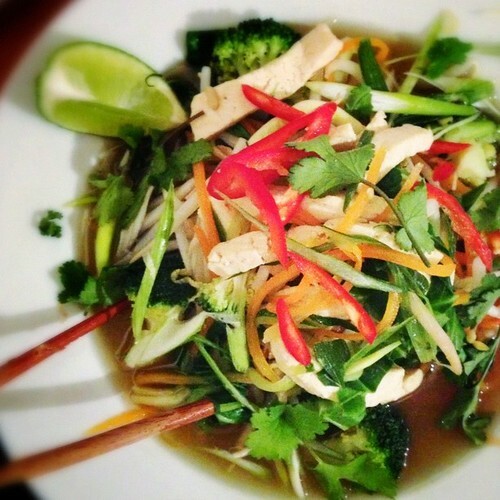 A recent favourite is vegetarian pho with julienned carrot and courgette “noodles”, broccoli and tofu. There’s also lots you can do with an egg (about 80 calories), be it hard boiled for a salad nicoise or filled with veggies and turned into a tasty frittata or omelet. My other motivation for fasting this way is the argument that your body gets the most benefit from fasting when you’re actually, well, fasting. But again, the science is patchy on this and, according to Mosley, it appears even if you do snack on a fast day, you still glean most of the ‘benefits’ of fasting. But that’s just me, and as Dr. Mosley explains in his book, that is the beauty of the 5:2 – you can tailor it to suit your own personality and approach to eating, as long as you stick to the basic rules. The thing to remember is that you can deal with going hungry for a bit. It might seem hard at first, but that’s only because we’re so used to being satiated all the time. Hang tight in the knowledge you can eat whatever you want the next day and just get on with life. I know. We’re foodies. It’s kind of a bummer to miss out on a meal. But it means we get to enjoy the meals we DO eat with more freedom and pure pleasure, and none of that pesky guilt stuff. The different essays I’ve read on the 5:2 idea are interesting–I’ve thought about trying it but haven’t quite taken the leap (have some PTSD from a ‘cleanse’ program I did a few years ago that incorporated fasting…shudder…) Awesome recap of how you approach it though!